Aadhaar is a unique 12 digit individual identification number alloted from the UIDAI(Unique Identification Authority of India) behalf of the Indian Government. Aadhaar number will act as both identity and address in India. The irrespective of age, gender any individual resident of india, satisfies the verification process laid down by the Unique Identification Authority of India UIDAI can enroll for Aadhaar. Every individual needs to enroll one time only with free of cost. Every Adhaar number is unique to a individual and it will remaining for a life time. 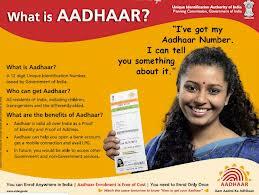 Aaadhaar is a Multipurpose National Identity Card project is an proposal of the Indian government.